The founder and director of the Anderson Hair Sciences Center, Dr. Ken Anderson, MD, ABFPRS, ABOTO, is proud to announce that he and his dedicated team of surgical technicians have completed the first and only 100 ARTAS robotic hair restoration procedures in the State of Georgia. The ARTAS Robotic Hair Restoration Surgery System performs the Follicular Unit Extraction (FUE) method of hair restoration with a level of precision and efficiency that simply cannot be matched by a human being. It allows Dr. Anderson to perform hair restoration procedures without using a scalpel, and without leaving behind the tell-tale linear scar that is associated with a traditional linear strip harvest procedure. Dr. Ken Anderson, MD, is very first and only physician in the State of Georgia to offer patients this cutting-edge technology. He performed the very first robotic hair restoration surgical procedure in September of 2013. Additionally, he was the first surgeon in the USA to perform a full FUE hair transplant, publishing the results of this groundbreaking case in April of 2004. Dr. Anderson has been performing hair restoration exclusively since joining a busy and dedicated hair restoration surgery practice in Beverly Hills, California in 2003. In 2011, Dr. Anderson received the Okinawa Award for his presentation about the Follicular Unit Extraction (FUE) procedure, which was delivered by the Japan Society for Clinical Hair Restoration in Tokyo, Japan. Dr. Anderson is unique in the field of hair restoration surgery. He is the only board-certified facial plastic surgeon in the world who has practiced exclusively hair restoration for over a decade…”Hair Restoration” is not on a menu of other procedures the practice offers. US regulations permit this procedure to be done by technicians and several hair restoration specialists will perform 3 or more surgeries a day. At the Anderson Hair Restoration Center, Dr. Anderson performs only ONE hair restoration surgery per day to allow Dr. Anderson and his entire team to focus on one patient for the day, and make sure to give the attention and care each patient deserves. They have officially completed their 100th hair restoration procedure on August 29th, 2014 using the world famous ARTAS robotic system. This revolutionary device is a state-of-the-art, surgeon-controlled medical device that safely and accurately extracts one single follicle at a time from the back and sides of the scalp. Every other FUE device, including the NeoGraft machine, is a hand-held instrument that a technician uses, with all of the associated inherent human error and variability. Because the ARTAS system is a robot, each and every graft is surgically extracted without human error and without human variability in the extraction process. 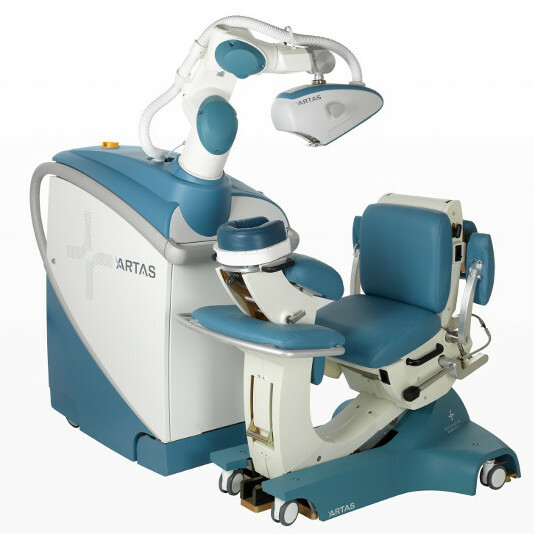 The ARTAS robotic hair restoration procedure has become very popular because it is a minimally invasive hair restoration treatment that does not require any plugs, scalpels, or stitches. In 2013 the ARTAS device won Gold at the 26th Annual Edison Awards, which is an international award ceremony that honors innovation. Led by Dr. Ken Anderson, MD, ABFPRS, ABOTO, the Anderson Hair Sciences Center is committed to providing high-quality care to patients who suffer with hair loss. He and his staff are committed to outstanding personal attention and individualized care, and natural, permanent hair restoration surgery results. With over 11 years of dedicated practice in the field of Hair Restoration Surgery, the highly-trained and caring staff will make sure that you are comfortable, and well-attended to during your procedure.